I am continuing using the Indie Chic Citron 6x6 pad. So far I have 19 cards. 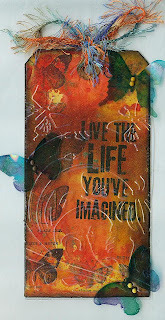 I made this one using a Coredinations cardstock background on a Recollections cardbase. 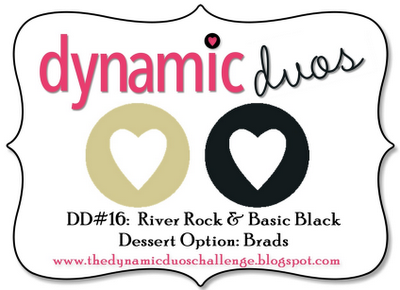 I found some die cuts in my stash and as long as they were in the same colors as the piece of Indie, I used them. I used Freshly-Made Sketch 45 for my inspiration. I am making as many cards as I can from one 6x6 pad along with some scraps and some cardstock. I have only used 6 sheets of paper so far and have made 10 cards. It's a 24 sheet pad, double sided. 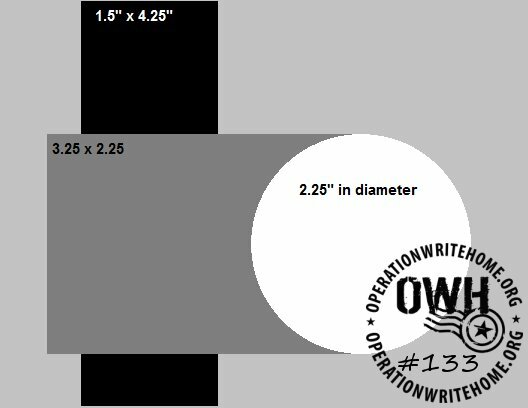 I am going to see how many I can made with this pad. I am using sketches from various sites to do this project, but more about that when I finish all 24 sheets. This is one of the cards I made in this project. 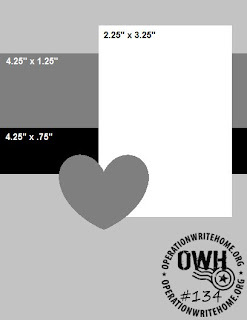 It is for OWH Sketch 135. The black cardstock is from Recollections; the blue is from my scraps. The printed paper is from a 6x6 MME Indie Citron paper pack. It is both sides of one sheet. The button was cut with a Martha Stewart punch and the string is from American Crafts. I stamped the sentiment with a Heartfelt Creations sentiment and sponged a little distress ink to tone down the blue background. I cut the picture corner with a SU punch. It's hard to believe that it is already the end of August. Where has this year gone? 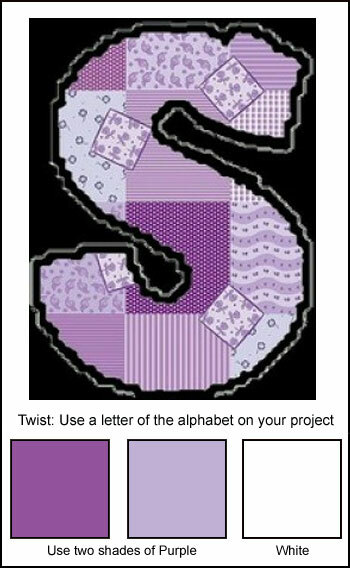 This week's challenge was to use two colors of purple, white and add an initial. I was doing a shaped card for another challenge and decided to use the same shape for this card. The purple paper is from my stash. The patterned paper is from SU. I have had the friend stamp for many years. I got the initial in a swap about six years ago. Finally found a use for it. The brad is from my stash too. I don't usually save the packages when I put brads and bling into small containers so I have no idea who made it. 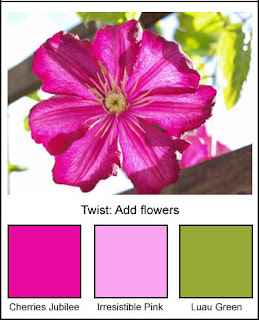 Both flowers from Petaloo were originally white. I colored the one with Copics to fit the challenge. 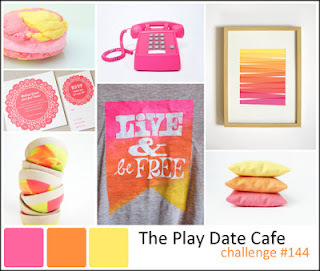 This is the first of the color challenges at Lady Anne's Paper Crafting blog site. I am happy to be a member of the Monday Color DT. 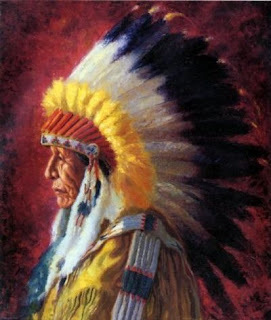 The first challenge is to copy colors from this beautiful color picture. I definitely detected fall in this, but was having a very difficult time doing just a "fall" picture. So, I decided to just go with fall colors and not worry about a fall scene. I remembered a card I had seen on Pinterest and saved so I went for a CASE. It isn't exactly the same, but the inspiration was there. It took a few tries to get the right color ink on the panels but I am now happy with them. The card can be just a note card or can easily be converted to a Thanksgiving card. The challenge today at Craftymess blog is Animals with a blue theme- insectsd. I found this dog stamp at a garage sale about a year ago and have never used it. It came in handy for this challenge. The background paper is from a 12x12 stack from Me & My Big Ideas. The cardstock was from my scraps. I stamped the image on GP110 from Walmart and colored it with Copics B21 and B23. The sentiment was computer generated. The ribbon is from American Crafts. 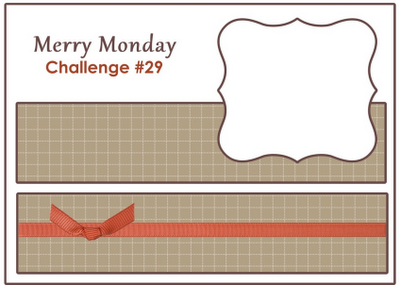 The challenge at Bugaboo this week is to use 1 ribbon, 2 buttons and 3 colors. I also used the Bugaboo Friday Freebie digi image. I got my Silhouette yesterday and set it up this morning. I cut the lattice background as my first cut. It works and I think I am going to like it especially for cutting around images that I have already colored. This is the card I created. The main colors I used are green, yellow and orange. The challenge at Stampin' for the Weekend is Pearls and Swirls. I already had this La-La Land Ballerina Marci colored, waiting for just the right card to come along. I used the Cuttlebug Swirls embosing folder, Spellbinders die, flourishes from Michaels, Pearls from Want2Scrap. Marci is colored with Copic markers. I popped the image die cut for some dimension. I thought I had posted this card, but when I looked at the cards on Crafting by Designs, I discovered that I hadn't. The challenge for week 3 of August is to use some type of water, reference to water, something that takes place on or in the water, or the word water in your project. I found this stamp in my stash. I had purchased it at a garage sale and it promptly got forgotten. I think it is perfect for this challenge. I used the new embossiing folder that is supposed to be zebra stripes, but it looks like rippling water to me. Of course, the boy is fishing in water so that goes with the challenge. I colored the image with Copics. The twine is from WRMK. 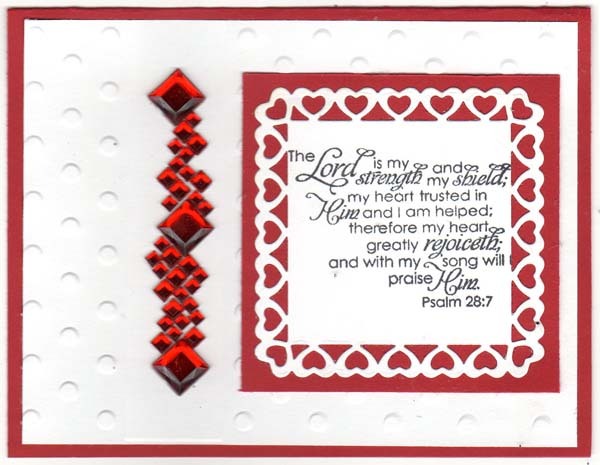 The diamond die cut and the sentiment background are from Spellbinders. The sentiment is from Hero Arts. For OWH Midweek Throwdown this week, the challenge was simply to make cards using your patterned papers along with dies & paper punches. Easy Peasy. I use these on the majority of my cards. Here is what I came up with. Not only did I use a punch (SU for the sentiment) and a die (Spellbinders), with the exception of the card base (Recollections), all of the patterned paper came from my scraps. I used Copics to color the image and Distress Ink on the die cut. Today's tutorial on Speedy TV was how to make a criss cross card. Although I have seen them, I never thought I would make one because they looked too difficult and time consuming. Well, challenge me and it's done! They were neither difficult or time consuming. Here is the tutorial. I started with a fresh sheet of 8.5 x 11 lime green from Recollections. The other papers came from my scraps. The image stamps are from Penny Black Hedgie Friends. I colored them with Copics. I used the sentiment from Hero Arts Find Joy set. Rozy told me about technique called Triple Stamping. She sent me directions on how to do it and then I googled it on You Tube. 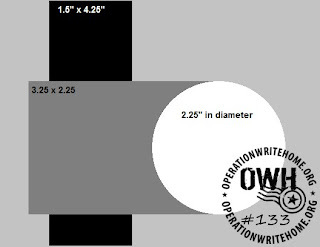 I found a site that gave me exact dimensions for the paper and tried it. This is my first try and I plan to do a lot more as soon as I get my Spellbinders dies that will cut layers to the right sizes. 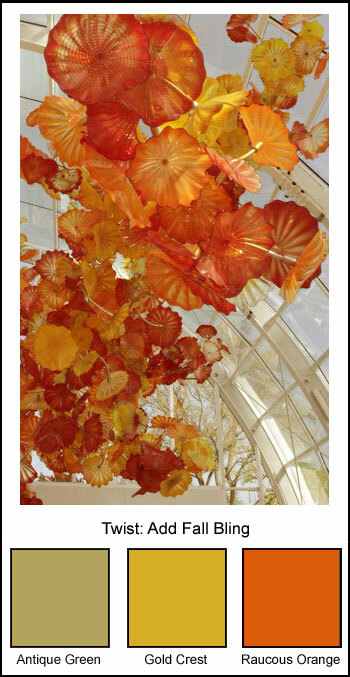 The color challenge this week is to use antique green, gold crest and raucous orange with a twist of fall bling. I was surfing the web and found this on Pinterest. It uses a Tim Holtz technique of using the packing material from a stamp package or embossing folder. This is what I came up with. I cut a piece of photo paper to 5.25 x 4 and used alcohol inks --Meadow, Sunset Orange and Sunshine Yellow -- on it. When it was dry, I stamped some TH stamps on it with Stazon Jet Black. I cut a piece of acrylic from an embossing folder package to size and embossed it with the TH folder to simulate bricks. I ran the acrylic through a 5 inch Xyron machine to give it a lot of adhesive to stick to the photo paper background. I added three metal fall leaves for the bling. Faux Patina was the theme for today's challenge on SpeedyTV Challenge. I had never done it before so I thought I would give it a try. I can't use the finished product for OWH because of the glitter, but I will send this card to Rozy as a thank you for the birthday check. I didn't have the distress ink colors Pat used in the tutorial, so I improvised with my own. I used Brushed Corduroy on the embossing folder; then followed it with Dusty Concord, Broken China and Vintage Photo. Up to this point I was really liking what I saw. Then I dabbed a few spots with Versamark and covered it with the gold Ranger Embossing Tinsel and heat set it and everything changed. I'm not sure I like the gold because it somewhat covers up the colors. I will give it another go and possibly use a clear embossing powder. I don't like the way it set up with the heat gun. It is still way too grainy. Maybe it was just the Ranger Tinsel. Most of the time it is much smoother than this mwhen I use regular embossing powder. This week it's all about our friends at Mark's Finest Papers. Nice friendly cards to warm the heart of a friend. I used a piece of scrap paper for the background and distressed it. I think I used Wild Honey, but since I put it away before I wrote it down, I am not sure. The sentiment label is from Spellbinders. I popped it with foam tape. The sentiment is from Verve Stamps Bountiful Harvest. The ribbon is from my stash. For years, I have had Perfect Pearls. I have never used them. Until today that is. I saw a tutorial on Splitcoast Stampers about using Perfect Pearls and thought is was time to fish or cut bait with them. Now I wish I had searched out tutorials a lot sooner. It was so easy and I love the way it looks. For this card, I used the Perfect Gold for the saying. This is my card for Merry Monday. I used Basic Grey Fruitcake collection, GP110 white cardstock and ribbon from Michaels. 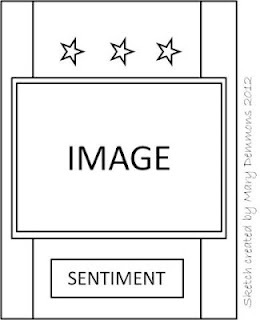 Use a sentiment only - no images! I bought this set of stamps from Kaisercraft when my stamping teacher used them in a class a cuple months ago. First of all, I sponged the piece of white cardstock with different colors distress inks. Then I stamped the "treasure" image on it. Using a Versamark Watermark pen, I traced over the letters in the word, the crown and the suitcase handle. I covered it with clear embossing powder and heat set it. The blacks are really shiny although it doesn't really show in hte picture. I also distressed the star paper to give it a little less brightness. The hearts were cut with my ancient heart punch from Creative Memories. I added Glossy Accents to the yellow heart. As soon as I saw the color combination, I knew which paper I was going to use. I got this pack from SU a few months back. It is all in the same shades of light brown and black. On this paper, the black is flocked. I cut the label with Spellbinders. The ribbon is from Michaels. The brads were from my stash. I used a light tan/cream color for the sentiment label and distressed it with Frayed Burlap distress ink. The challenge was simply to use sponging. I used three different colors of Distress Ink - Worn Lipstick, Barn Door, Fired Brick - to sponge the background. Then I embossed it with a Sizzix embossing folder. The card base is from Recollections. The flower is Petaloo and the brad is from Autumn Leaves. 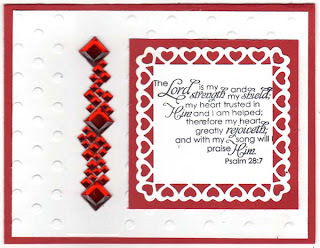 The sentiment is Our Daily Bread Designs Thank God stamp. The challene was to use kraft paper. I made this very masculine card using a kraft base and two pieces of scrap. I used a Fiskar's border punch and a SU sentiment. I cut the circle piece with a Marvy 2" punch. I'm not really thrilled with the end result. I think I am going to have to do a little more to make me happy. The tutorial on OWH today showed how to make this cute Santa card. It was really easy and didn't take very long at all. I used scraps of red, white and black, 3 black brads, a piece of black satin ribbon and the pull tab from a soda can. I cut the beard with Spellbinders scalloped ovals and then embossed it with a Cuttlebug embossing folder. I stamped the greeting with Versamark and then embossed it with white embossing powder. Lady Anne provided the image for this challenge. I colored the image with Copics. The paper is all from Echo Park 6x6 Country Drive Collection. The ribbon was from my stash. The sentiment stamp is from Stampin' Up. I used some scraps for the patterned paper. The image is from La La Land stamps - Marci with Cat, colored with Copics. The flowers, sentiment and ribbon are from my stash. I colored white ribbon to match Marci's dress. The flower centers are Liquid Pearls. I tried to make the cat to match my Nutmeg, but it isn't quite the same. Crafting by Designs is lamenting the high heat and humidity of this summer. Their challenge for this week is to create any thing BEACH related. I used this adorable bear image from Guylou. I colored it with Copics and used foam tape to adhere her to the card. The sentiment, sea shell and clam are from Hero Arts. I used a piece of cork for the sand. The "water" is from a piece of paper I've had for some time. This card was made using the OWH Stars and Stamps sketch #133. I am entering it in that challenge and in Robyn's Fetish challenge to made a monochromatic card. I used Recollections cardstock for the base, the other cardstock was from my scrap bin. The printed paper is from Echo Park Dots & Stripes 6x6 paper pad. The sentiment is Hero Arts. I chose feathers with the cute little blue jay. I stamped the jay onto a 5.5 x 4.25 white card base. I used Prisma Color pencils to color the image. The sentiment stamp is from Hero Arts. I am doing this challenge because I have always like the combination of pale pink and pale green together. I remember when I was in second grade, I bought my mother a pin cushion of these colors. Unfortunately, she didn't share my love of the color combination. I used Bazzill embossed flowers for my background. I embossed the green with a Sizzix embossing folder. The flower is from SU Mixed Bunch stamp and punch. I added Liquid Pearls to the center of the flower. The sentiment banner is cut with Spellbinders and the sentiment is Hero Arts. I saw a color challenge when I was surfing this morning, but I didn't have the image stamp they required. I decided to do it anyway using their colors - pastel colors of the rainbow. So, I surfed a little further and found a couple challenges that it would qualify for. I used the pastel colors from my scraps. I die cut them with my new Die-Namics Hexagons Dies. Once cut, I adhered them to a 5.25 x 4" piece of cardstock and then laid them out in order of the colors in that first site. Then I ran that piece through my Big Shot using the circles embossing folder. I added the pastel colored ribbon and then adhered the piece to the card base (Recollections). The image is from Penny Black, stamped on white cardstock and colored with Copics. I cut the background for the image with my Spellbinders die. The little tiny butterflies on the image are from the outer circle of the die. I colored them with Copics and adhered them around the flower and on the sentiment die cut. The sentiment die cut is from an SU punch. I adhered the sentiment to the card with a little foam to give it a little dimension. I think I need to get more Sweet 'N Sassy stamp sets. I only have the summer and the sport one. I love the SNS sketches and have a good time doing them. For this sketch, I chose the Coco football stamp and colored it with Copics. The card base is Recollections kraft paper. The other cardstock was from my scraps. The dp is Echo Park 6x6 Dots and Stripes. Ribbon is American Crafts. The shapes were cut with Spellbinders. I am also entering this in Mark's Finest Papers. The challenge is to use dots. I keep looking for challenges to enter - ones that really picque my interest - i.e. ones that have prizes. I was searching this morning and found The Play Date Cafe. The challenge was a color challenge. I used techniques that I learned in both Tim Holtz's Creative Chemistry online class and the recent Stretch Your Stamps. This is my card. To make this card, I used a sketch we did in Linda Howard's class last week. I formed the card from a piece of orange Recollections cardstock. I cut the four yellow pieces from a piece of yellow Recollections cardstock. Again, Recollections for the pink. I sponged Picked Raspberry, Spiced Marmalade and Squeezed Lemonade Distress Ink on a piece of white cardstock and stamped the image over it with a Martha Stewart stamp and Archival Ink. I used the same stamp and the Squeezed Lemonade ink to stamp the images on the smaller yellow cardstock. The sentiment is from Hero Arts. The twine is American Crafts. Today's challenge on 2 Sisters is Challenge #104 ~ On The Farm. I have had this Penny Black stamp sitting on my craft table for about a month. I was it on sale and couldn't resist it. So, I stamped it twice and colored it with Copics for both a boy and girl card. The card base and cardstock are Recollections. Thedp is from my scraps. The sentiment is from Hero Arts and the button is American Crafts. I fiinished it off with some googly eyes from Michaels.